The Carpet Chemist gives you the very best value for your Louisville Carpet Cleaning Service, which saves you time and money. Don’t spend thousands on replacing your old carpet. We can bring it back to life with our professional carpet cleaning equipment and solutions. Walk through inspection. A walk through inspection with the home owner is where you can walk us through each room and point out any areas of concern. Carpet Pre-treatment. Our Fresh Key Lime Extract Carpet Chemist pre-treatment is applied to the carpet prior to steam cleaning to help destroy the soils, oils and funky odors from your carpet. Difficult Spot Pre-treatment. 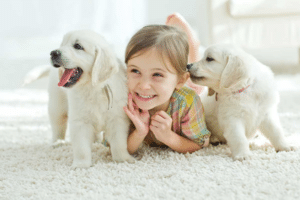 Difficult spots such as gum, slime, candy or other sticky messes your kids may have in their rooms are spot treated with another spotting agent prior to steam cleaning, to help release from the carpet fibers. Professional Truck-Mounted Steam Cleaning. We crank the heat up on our powerful carpet steam cleaning machine to obliterate germs and easily remove dirt in your carpet. Powerful Suction. Half the battle of professionally cleaning carpet is being able to remove the soil hiding deep down in the carpet fibers. Our equipment has enough suction power to lift a 10 pound bowling ball. Neutralizing Rinse. Our Carpet Chemist neutralizing rinse is what lowers the pH level of your carpets and makes your carpets feel soft and fluffy. Extra Dry Passes. This is something you wouldn’t even notice unless we told you. Once we fully clean each room, we take an extra step and go back over the room for pure extraction. Most carpet cleaning companies won’t do this, because it’s essentially cleaning each room twice. The benefit is that it cuts the drying time in half, so you can get things back to normal, quicker. Scotchgard Carpet Protector. We highly recommend upgrading your professional carpet cleaning by adding our Scotchgard Carpet Protector service after each cleaning. This will protect your carpet from absorbing spills and becoming stains. Pet Urine Enzyme Treatment. Our Fresh Key Lime Extract Carpet Chemist Pet Urine Enzyme Treatment is scientifically formulated to eat and digest odor causing bacteria, which eliminates smells forever. Specialty Stain Removal. Some stains require a more advanced process to be removed. Red wine or Kool-aid are one example. We have a red stain removal process that will completely remove every bit of wine or juice from your carpets. Speed Drying. If you require your carpets to be dry before 6 t 8 hours, we can accommodate you by placing industrial grade air movers designed specifically to dry carpet in no time at all. Salvage Cleaning. Salvage cleaning is for carpets that have been used and abused. Sometimes renters can leave carpets trashed, and landlords don’t want to replace fairly new carpet. Our salvage cleaning includes all the processes listed above, with a dual rotary carpet scrubbing machine added for deep down agitation. Find out what customers are saying about our cutting-edge process and five-star service! Call (800) 515-1342 to schedule carpet cleaning, carpet dyeing, carpet repair and specialty stain removal. For your convenience, you can also upload an image of your carpet stains and your friendly neighborhood Carpet Chemist will respond with a free phone estimate. You’ll be glad you did!